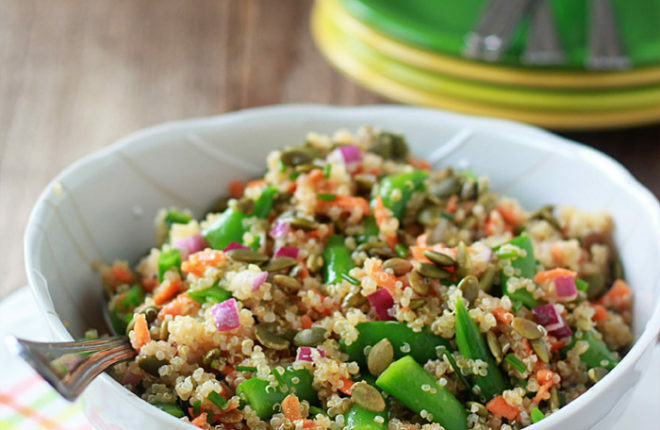 This light, veggie-packed, and protein-rich salad is equally perfect for potlucks, packed lunches, or super-easy dinners. This salad contributed to a bit of a shocking Saturday night meal for my guy. We dined on roasted artichokes along with generous scoopfuls of this lovely little number, and while he was aware that the meal was clearly meatless, he was a little taken aback when I told him it was actually vegan, too. My dedicated (but open-minded) carnivore jokingly shot me a “are you trying to kill me? !” look; and then he dug in. And we were satisfied (stuffed, actually) at meal’s end. 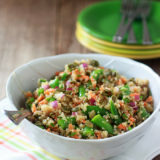 This colorful quinoa confetti salad is one of those great versatile dishes that works just as well as a main dish for dinner as it does a side. And as lunch? Fuggedaboutit. Perfection. Plus, it’s pretty, too. I’d been trying to come up with a quinoa-based veggie patty to share with you today, and was failing. Stupid falling apart veggie burgers! 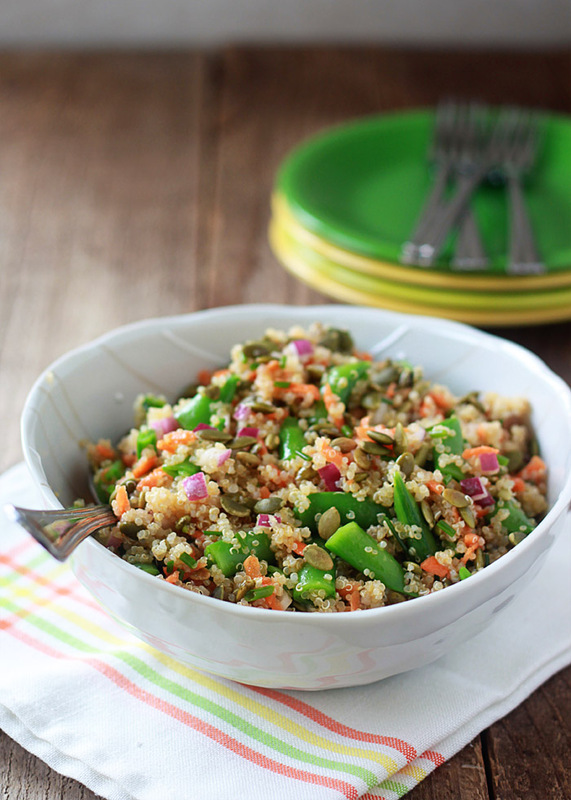 So I decided to put my remaining quinoa to better use: this protein-rich, veggie-packed, party of a salad. 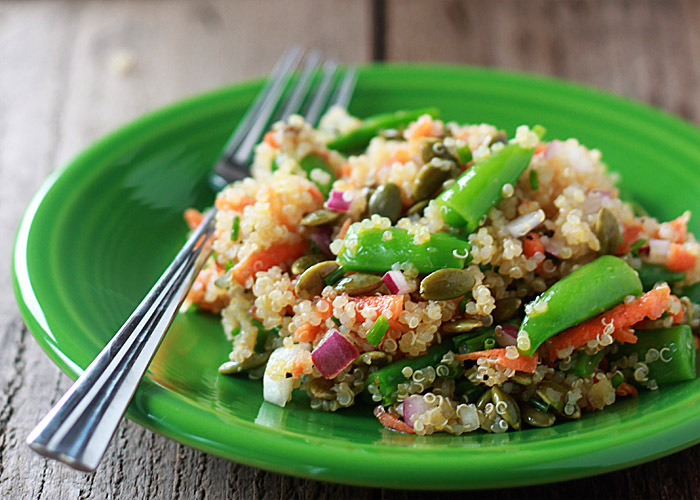 I used vibrant sugar snap peas along with crunchy grated carrot and a double onion-y (but not overpowering!) one-two punch: some finely chopped red onion, and a nice handful of spring chives. In fact, if this salad wasn’t so dang colorful, I would have gone with its original name, “spring quinoa salad.” But “confetti” won out. Confetti should always win out, actually. Even if you’re vacuuming it up for years (actual confetti, not this salad). Both my slightly vegan-averse guy and myself believe that the lightly toasted pepitas make this simple salad sing. That added little crunch adds the perfect amount of texture to each and every bite. 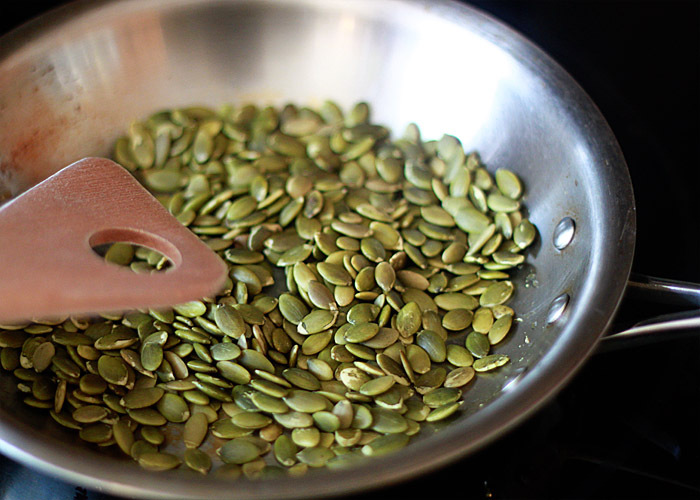 It takes just a few minutes to toast the pepitas in a saute pan. Definitely worth it. This salad is terrific right after it’s tossed together, but next-day portions are even better. Totally the bee’s knees. Lunch leftover recipes = the best kinds of recipes. So, hey! Have you noticed things look a tad different around here?! I am so freaking beside-myself pumped to unveil my brand spankin’ new site! This time around, I hired the pros to take care of business and, man. SO WORTH IT. Artist Katt Frank created the hand-illustrated logo – isn’t it neat?! And the ever-awesome Purr Design designed and developed the site, which is just so spiffy I could cry. Happy tears, of course. We’ve been doing a lot of behind-the-scenes work to make Kitchen Treaty much easier to navigate. It should now be way, way easier to find a specific recipe and much more pleasant to browse if you’re just shopping around. I really hope you like the new, improved Kitchen Treaty as much as I do. And if you have any suggestions, those are always welcome, too. Cook the quinoa according to package directions. Set aside and allow to cool. Fill a medium saucepan half full with water and bring to a boil. Add the sugar snap peas and boil for one minute. Using a slotted spoon, transfer peas to a few layers of paper towels to dry and cool. When cool enough to handle, cut into 1-inch long pieces. Place a medium saute pan over medium heat. Add the pepitas and cook, stirring constantly, until toasted and fragrant, about 5 minutes. Set aside and allow to cool. 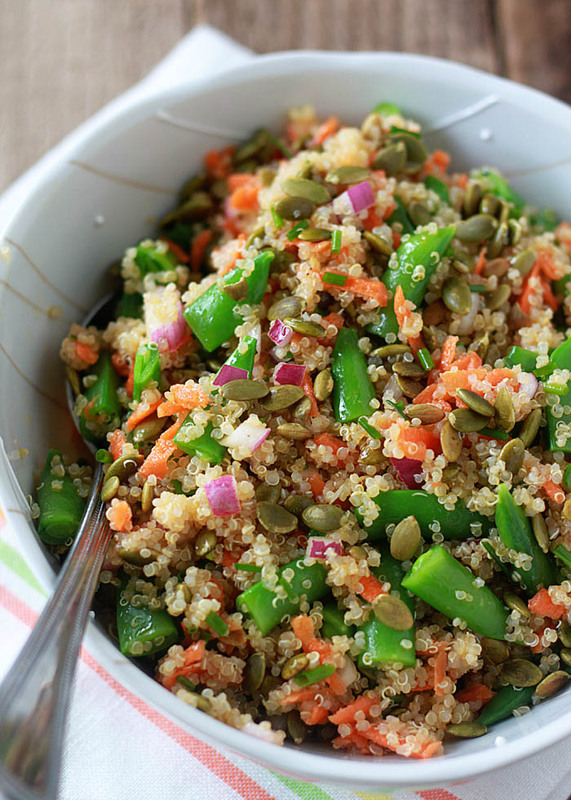 Add quinoa, peas, and pepitas to a large bowl along with the carrots, onion, and chives. Toss to combine. In a small bowl, whisk together the olive oil, vinegar, salt, and pepper. Pour dressing over salad and toss again to coat. Taste and add additional salt and pepper if desired. To store, cover tightly with plastic wrap or transfer to an airtight container. Refrigerate for up to two days. I love those added pepitas! Adding toasted nuts makes any dish better! Yum! This would make the perfect leftover lunch! Thank you so much, Hannah! This is a gorgeous salad! The crunch of the pepitas and snap peas. The colors are beautiful. Caught my eye immediately! You don’t really realize how much extra oomph toasting your seeds and nuts can add, until you actually try it for the first time….and then you wonder why you didn’t do it sooner! It’s true! 🙂 Thank you for the pin! Just had something really similar for lunch! I highly recommend it! This salad is so beautiful and full of things I love! We live on quinoa salads like this. They are so great to pack for lunch or even as a light dinner or side dish. Love this…pinned! Gorgeous salad! Love all the variety of healthy goodness in here, so perfect for the transition to summer. Pinned! This is very yummy. I’m enjoying it now. I added a bit of white miso to my dressing and next time I might throw the vegetables in with the quinoa at the last minute and skip blanching. Lovely idea, thanks for sharing. I’ll make it again. Oh goodness, love the idea of the miso, and I also like your idea for streamlining the recipe. If it works well to make it that way, please come back and let us know! This salad is so good! I made it a second time and plan to make it again this evening. Throwing the vegetables into the quinoa pot worked quite well, I’ll continue to do it this way. Thanks again for this great recipe. Delicious!! I’m definitely adding this to my Mealfire list of recipes. I followed the recipe exactly and only added 1/2 cup chopped red cabbage and 1/4 cup minced cilantro as well as maybe a 1/4-1/2 teaspoon paprika to the dressing. Thanks for the idea – and my kiddos love it! So glad to hear it – thanks for letting me know! Love the adaptations – sounds great. This stuff is so delicious!! I am calorie counting now, do you have the nutrition facts for this? I made this recipe for the first time tonight, and thought the mixture of ingredients made for a nice summer salad. However i did change a couple things. I used a combination of white and red quinoa as i find the white quinoa rather bland. Red quinoa has a much nicer, overall nuttier flavor. Next time i will just use red quinoa, to make the nuttier flavor even more pronounced in the dish. I also reduced the amount of olive oil a to 1/8th of a cup and added juice from one lemon to the dressing to brighten the flavors of the veggies. this worked nicely! i also was looking for some additional protein for tonight’s meal, and had some Bell & Evans chicken tenders on hand, so i cook them up to a nice crispiness, sliced them and served them over top of the quinoa salad! P.S. i could see tofu working really nicely in this dish as well! Yes! I need to try that.